Joint Chiefs Nominee Says Russia Could Pose 'Existential Threat' To U.S. : The Two-Way Marine Gen. Joseph Dunford said that Moscow poses the greatest threat to U.S. national security and that Ukraine requires U.S. arms to counter Russian aggression. 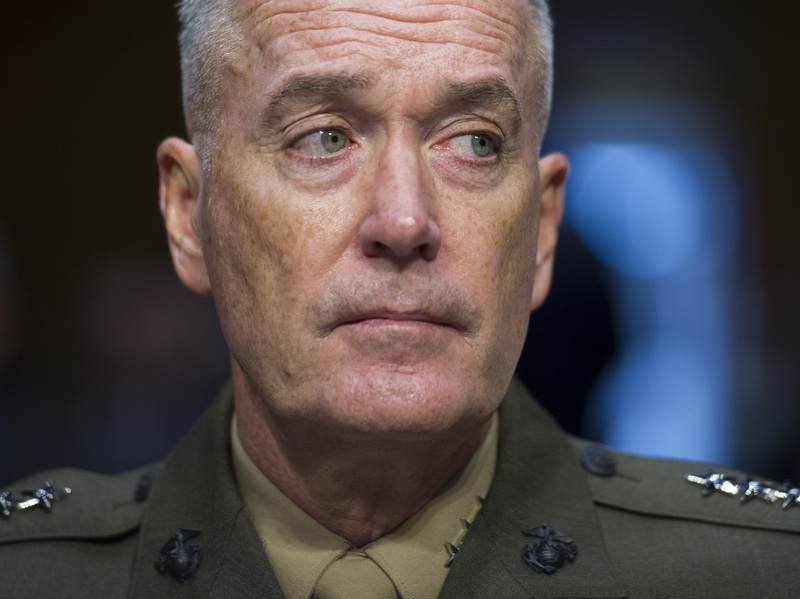 Marine Corps Commandant Gen. Joseph Dunford Jr. testifies Thursday during his Senate Armed Services Committee confirmation hearing to become the chairman of the Joint Chiefs of Staff. The Obama administration's nominee to become the next chairman of the Joint Chiefs of Staff warns that Russia is the biggest threat to American interests and describes Moscow's recent geopolitical moves as "nothing short of alarming." Marine Gen. Joseph Dunford Jr., speaking at his confirmation hearing before the Senate Armed Services Committee, said: "Russia presents the greatest threat to our national security. ... If you look at their behavior, it's nothing short of alarming." Dunford, 59, said it would be "reasonable" to send lethal weapons to Ukraine to help it battle Russian-backed rebels. "Frankly, without that kind of support, they are not going to be able to defend themselves against Russian aggression," he said. "[If] you want to talk about a nation that could pose an existential threat to the United States, I'd have to point to Russia," he told senators. Relations between Washington and Moscow have deteriorated to a post-Cold War low since Russia annexed Crimea last year and began backing Russian-speaking separatists in Ukraine's east. Gen. Dunford, who was nominated by President Obama in May, is currently the commandant of the U.S. Marine Corps. Previously he served as commander of the allied forces in Afghanistan and commanded the 5th Marine Regiment in Iraq. Arkansas Republican Sen. Tom Cotton asked Dunford whether Iran would use income from an end to economic sanctions to fund Shiite militias in Iraq and to destabilize governments elsewhere in the Middle East. The general replied: "I think it's reasonable to assume that." According to The Associated Press, Cotton also asked Dunford whether the U.S. has the capability to destroy Iran's nuclear facilities. "My understanding is that we do," he replied.